Always one to take advantage of a situation, I quickly looked into tickets for the Rockies when I found out I was heading to Denver for a trade show. Luckily one of our Sales Managers lives there, and knows someone who works for the team. Hello 32 rows behind home plate for the low price of $0. Coors Field was built in the early-mid 90s, but has the feel of a more modern day ball park: wide concourses, plenty of concession stands, and great bars sprinkled around. My guess is they’ve stayed on top of updating it throughout the years. The Rockies are rolling right now, and with the Diamondbacks in town contending for first place in the National League West, the atmosphere was great. These fans have been waiting since 2007 to have a winner again. As far as the food goes, it was pretty solid, and not too pricy. I got a hotdog for $4.75, and it wasn’t a cheap, gas-station one either. Beer prices were pretty normal and what you’d expect. As far as the stadium, baseball wise, it’s pretty unique. The bullpens are in right-center field, and come complete with pine trees and a fountain. I know Miami has that absurd whatever-the-Hell-it-is, but this is perfect for Colorado. All-in-all I recommend visiting this park if you’re visiting Denver. 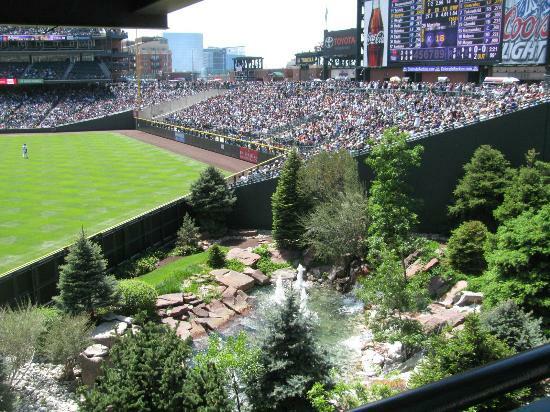 If you’re a baseball fan, and looking for a new park to visit, plan a trip to Denver. I won’t get into all my Denver exploits on here, but you won’t regret a trip there. It’s a fun place.